#6: Webinars are a lot of work. Much creating and researching. Then practice and deliver it. After you do it, lots of work putting it out there. #10: Playing Candyland with the kids on this Mothers Day. Key is to draw that Ice Cream Cone pink card. Sure path to victory. My own theory is that each of have talents that are uniquely strong in us. For some, these talents would put them on the world stage. For most of us, they’d probably vault us to the top of a particular field. And yet I suspect that most of us never hit on those unique talents. 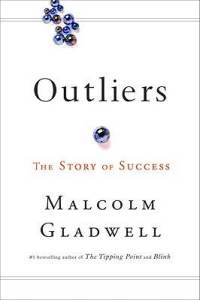 Malcolm Gladwell currently has a book out titled Outliers: The Story of Success. In it, he examines the underlying factors that propel certain individuals to the very top of their fields. I have not read the book, so I’m picking up its contents from various sites I’m reading and a couple interviews with him that I’ve heard. He credits Bill Gates’ success to early and sustained access to high-end computers. Gladwell concedes that Gates is obviously brilliant, but still notes that many other brilliant youth never had the chance to become computer stars of Gates’ magnitude because they didn’t haveaccess to these sophisticated computers. I heard Gladwell on NPR talking about this. It turns out he attended one of the few schools in the country, high school or college, with access to a mainframe computer where students could program. Now Gates had a passions and aptitude for programming. So there was this great mix of talent and circumstances that allowed it to flourish. Doesn’t that make it sound like success is something outside of an individual’s control? I don’t mean to go that far. But I do think that we vastly underestimate the extent to which success happens because of things the individual has nothing to do with. I don’t want to leave this post on a down note. Many, many of us will find vocations that we are good at, and which make us quite happy. We have family and friends which enrich or lives. Personally, having gone from one profession I really enjoyed (banking) to another (enterprise 2.0), I know there are a wide range of fields that each of us can do well at and be happy. And with a lot of luck, a very few of us find the mother lode.